This is the best way to serve corn on the cob, brushed with melted butter and sprinkled with chili powder, cotija cheese and lime juice! This makes a great bbq spice rub with a distinct Mexican flavor. It’s probably the best bbq rub recipe I’ve found for Mexican style corn. Very authentic. Thanks to The Seaside Baker for this one. your favorite bbq rub. I’ve included the Mexican bbq rub recipe below if you want to make your own. And farther down the page are some great selections and ideas I’ve picked out from the various fantastic bbq rubs that are available, if you don’t want to deal with making your own barbecue rub. I’ve tried all of these and they’re all fantastic on corn but my absolute favorites are the Creole rubs and the Mexican rubs. Several of the rubs listed for sale at the bottom of the page are award winning rubs so I highly recommend you try them out. 6 ears corn, unhusked – A lot of people balk at grilling the corn without stripping the husk, washing the corn, and putting the husk back on. That’s absolutely not necessary,, and it compromises the heat protection that the corn has. You wan’t believe the improvement in the flavor by grilling unhusked corn over naked corn that’s grilled, steamed or boiled. I promise, if you grill your corn without stripping the husk you’ll never go back to any other way of cooking it! 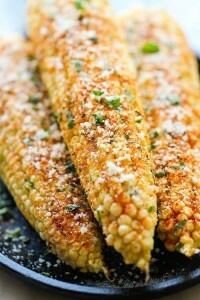 Place corn, in its husks, directly on the grill grate. Roast until tender and cooked through, about 40-45 minutes. Peel down the husks. Rub each ear of corn with 1 tablespoon butter. Serve immediately, sprinkled with chili powder, cotija, cilantro and lime juice.